The Healthcare and Social Services sector has undergone major upheaval over the last several years. With the reorganization within the CISSS and CIUSSS, meetings are held more and more in French or, at best, everyone speaks their own language, which implies that everyone understands each other. It has become essential as a professional or manager in this sector to be able to express your point of view clearly. 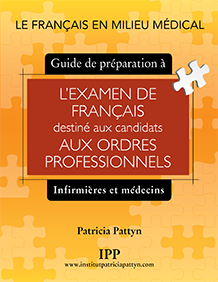 The “French at work for Healthcare Professionals and Managers” courses respond to this new reality. They are tailored for you. Our first meeting will consist of an evaluation of your knowledge and skills in relation to your current or future responsibilities. Next, we will discuss the results of the evaluation, your expectations and your objectives and together we will establish a realistic plan of action. At the end of the meeting, you will have a clear idea of the direction we will be taking. We will work with your strengths, taking into account what you already know, and we will provide you with what you are lacking so that you can be at ease speaking French in your professional duties. To communicate clearly and with confidence, it is necessary not only to have the vocabulary required, but also to be able to “put the words together” to create a sentence that has correct syntax. At more advanced levels, it is a matter of being able to express an opinion with firmness or to offer a critique with subtlety. In order to help you assimilate what we are doing during the course, we will give you “homework” that can range from exercises for grammar or pronunciation to reading relevant articles and documents, to watching short videos. This course, as with the material, will be based on your needs and challenges. We are aware that it is not always easy to find the time to study or to travel to attend a course. Therefore, we offer various options: classic face-to-face courses at our office or yours, or courses via Skype, at a time that is convenient for you. In conclusion, your work is at the centre of our meetings and we believe that a structured approach, based on objectives, and tailored to your needs, provided in a respectful and professional manner, will enable you to acquire the skills necessary to make French an asset in your career.